Founded in 1972, St. Peter’s Nursery School is a non-profit, non-sectarian program of St. Peter’s Church. We welcome families of all faiths and ethnic backgrounds. We offer classes for three, four and five-year-old children. Our program provides a nurturing environment that promotes the social, emotional, cognitive and physical development of young children. At St. Peter’s we believe in learning through discovery. Our focus is on the child as an individual, growing, experiencing, developing, learning about him/herself and the world around him/her. Our goal is to provide an enriched environment in which this natural curiosity is enhanced and nourished, an environment that encourages a child to think, question, reason, predict, and experiment. Our playground offers a very large fenced-in area which includes several playsets and lots of space to climb. There are sunny and shady areas, a large playhouse, a huge sandbox and a large tire for climbing and class gatherings. St. Peter’s Nursery School has consistently been awarded accreditation by the National Association for the Education of Young Children. NAEYC recognizes early childhood programs which meet national standards of quality. The nursery school is licensed by the State of New Jersey. Each class is taught by two teachers who are certified in early childhood education. Additionally, every teacher has been trained in First Aid and CPR. Most of our teachers have been here for more than a decade. Please explore our site to find out more about us. 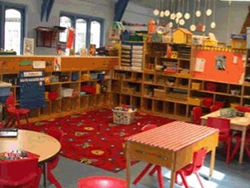 We invite you to be a part of the St. Peter’s Nursery School community!